I have a little bit of wanderlust in me. It's my dad's fault. We grew up in the Philippines, often traveling to different places on the weekends. While we were on furlough in the States, we traveled all over visiting the churches that supported our family's ministry. It was always an adventure, not matter what went wrong or came up unexpectedly. I grew up in the back seat of a minivan, enamored by the experiences of seeing new places and people. So, now I'm a grown-up who still likes to hop in the car to go somewhere for the weekend, often on a whim. I would love to visit as many places as I can...some of which are reflected on this list I shared before. There are a few things I would add to that list, but I can share those another day. 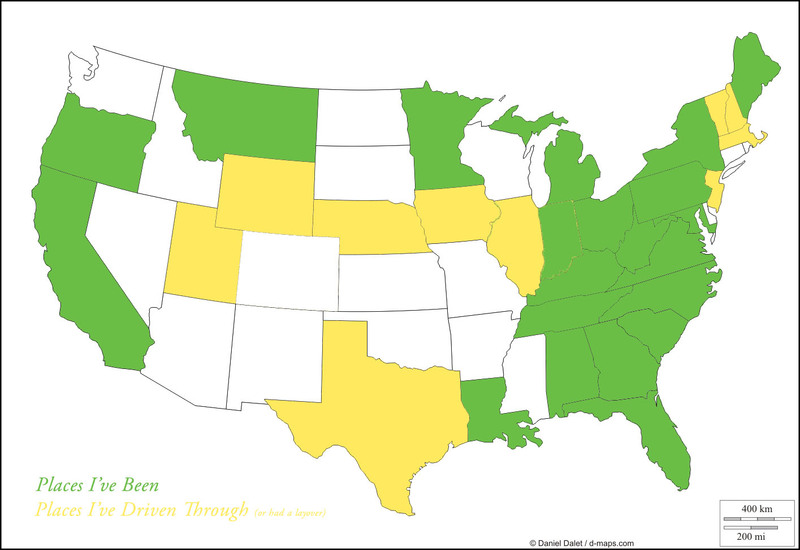 Today I felt the need to literally (observe my correct use of this word) map out my progress on the "Visit all 50 states" item on my list. Here it is. I felt like it was going to be more filled in than that, but when I actually got these places down, I realized how many states I have yet to check out! For the record: Hawaii would be yellow. Alaska would be white. What's your favorite state to visit? Any recommendations on things to do in the states I have yet to see?